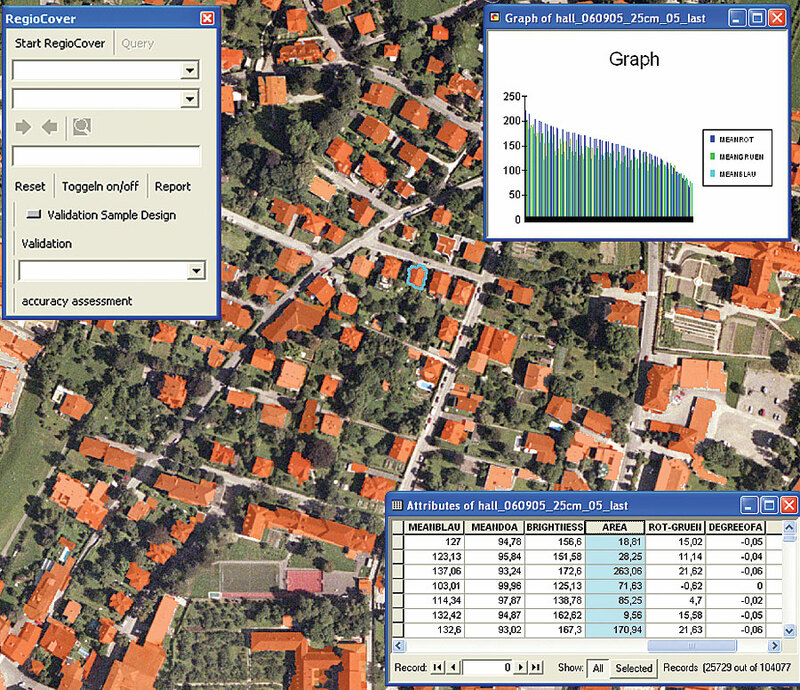 ArcGIS models and macros were developed to establish a complete workflow. GeoVille was able to reduce the cost of manual analysis by 30 to 40 percent. Customers can now make better and timelier business decisions. Based in Austria and Luxembourg, GeoVille Group is an environmental and geospatial consulting company serving a global customer base. The company specializes in products and services for earth observation (EO) and GIS. GeoVille's portfolio includes spatial planning, forestry, and environmental applications, as well as land-use and land-cover mapping. Clients include private enterprises, international organizations, and government bodies involved in urban, regional, and infrastructure planning and environmental monitoring. A quality control urban land-use map, which GeoVille generated with GIS. With increasing pressure on organizations and agencies to assess the environmental impact of regional policies and activities, there is an ever-growing demand for reliable land-use information. In Germany alone, every day some 100 hectares of landthe equivalent of 200 soccer fields (football pitches)are lost to urban development and transport infrastructure. With 75 percent of Europeans living in urban areas, it is a similar story across the continent. In developing countries around the world, increasing urbanization leads to megacities, which face severe health and safety challenges from uncontrolled land consumption and growing slums. Strategies for soil protection and monitoring systems are urgently needed all over the world. An example is the joint initiative of the European Commission and European Space Agency, Global Monitoring for Environment and Security (GMES), which was established to address those issues by building a space- and ground-based infrastructure to provide reliable and timely EO information services. Customers need to be provided with harmonized, high-quality spatial information across all environments, enabling them to compare different regions and cities of interest. The produced geospatial data must contain well-defined and standardized levels of precision and confidence levels to be a reliable basis for decisions. Finally, the service must be highly scalable, supporting all types of modern spaceborne and airborne sensors. As a key player in GMES, GeoVille Group aims to develop reliable, standardized, and affordable mapping and downstream services that provide harmonized, high-quality spatial information and support customers in the implementation of European directives and their national realization. To this end, GeoVille worked with longtime partner Definiens, the German company that specializes in analyzing and interpreting images on every scale. By integrating the Definiens Enterprise Image Intelligence platform with its existing Esri ArcGIS workflow, GeoVille created RegioCover, a highly automated, accurate, and reliable cross-border application for operational urban and regional land-use mapping to reveal detailed pictures of built-up areas. This solution allows mapping of land cover and land use over different biogeographic regions using terabytes of image data in an operational and cost-efficient way, covering specific image preprocessing tasks, rule-based image classification, postprocessing, and quality control. The processing chain consists of ArcGIS and Definiens software components that have been customized, extended, and integrated by GeoVille. The core of the processing chainsegmentation and classification applicationsis based on the Definiens Enterprise Image Intelligence Suite. The Definiens Extension for ArcGIS provides a complete set of GIS processing tasks. In addition, a range of ArcGIS models and macros was developed to establish a complete workflow for transforming large volumes of raw image data into reliable quality-controlled geoinformation. Large-area mapping projects not only require image classification tools but also need a set of powerful GIS tools to efficiently manage, process, and deliver meaningful geoinformation to customers. 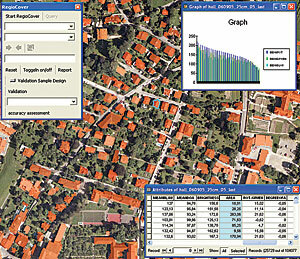 Typical tools and extensions comprise object-based change detection, flexible application of standardized geometric map properties (e.g., minimum mapping units), map generalization tasks, attribute table management, and rapid point- and object-based validation of land-cover/use maps directly within ArcGIS. With RegioCover, GeoVille can focus on its mission to offer innovative and affordable geoinformation products with high levels of precision for its customers. In most cases, RegioCover achieves close to 90 percent accuracy in identifying land cover and land use. This is an average 20 percent improvement over pixel-based analysis systems. At the same time, GeoVille was able to reduce the cost of manual analysis by 30 to 40 percent. "The bottom line is this: GeoVille customers can now make better and timelier business decisions," says J�rgen Weichselbaum, head of the technical department at GeoVille. "The importance of this cannot be overestimated." The European Environment Agency (EEA) has recently recognized the important role that GeoVille plays in land-cover and land-use mapping. "Technology like the one developed and applied by GeoVille will in the future certainly help bridge the gap between regional, national, and European land-cover and land-use mapping," says Chris Steenmans, EEA. GeoVille sees many opportunities of further intensifying the future use of ArcGIS products in combination with Definiens technology. The aim is to offer object-based change detection, enabling customers to update maps and detect changes to the environment automatically. For example, it would be possible to examine land-use changes in a specific location or over a large area by comparing images, even if those images were taken under different conditions or by different imaging systems. Here, the availability of high-resolution SAR data from TerraSAR-X will open a new dimension, allowing rapid mapping of large areas in tropical and subtropical countries. Currently, RegioCover involves a number of discrete software components. In the future, GeoVille plans to integrate these components so that the results produced by one component are automatically imported to the next component. The entire process chain would be controlled by a single interface, making the system even easier to use and giving people without specialized training or experience access to RegioCover's full capabilities. Here, Esri's ArcGIS Image Server is ideally positioned to manage the data provisioning work. The planned integration of Definiens technology with ArcGIS Image Server will complete the workflow. This integration would, in turn, enable RegioCover to perform fully automated and enhanced batch processing, capable of producing complete land-use maps without any manual intervention. For more information on GeoVille, contact J�rgen Weichselbaum, GeoVille (e-mail: info@geoville.com), or visit www.geoville.com. For more information on Definiens, visit www.definiens.com.